Running from Sunday 25th of January to Thursday 29th of January this year, the magical whirlwind that is Paris Haute Couture Fashion Week has officially come to an end presenting us with some of the most stunning and boldest haute couture creations to date. 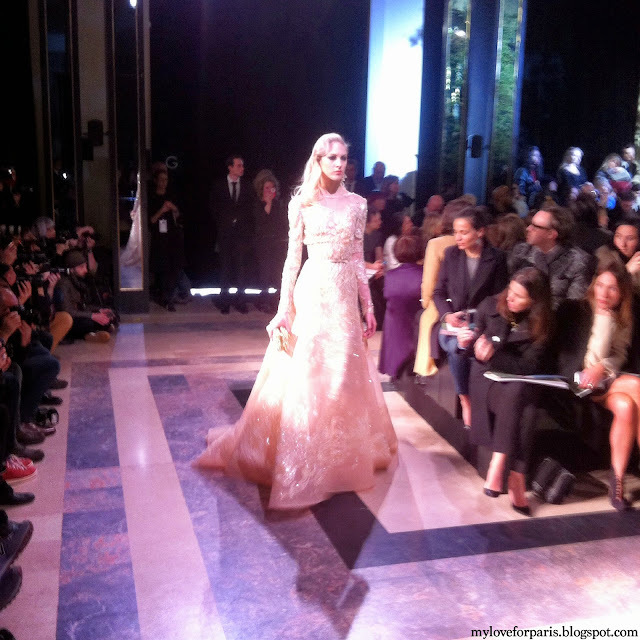 This week, I was lucky enough to experience my very first Paris Haute Couture Fashion Week show at none other than the romantic ethereal Elie Saab défilé. Fifty five beautiful creations gently floated along the runway in dreamy soft hues of powder pink, beige, blue and ivory as well as striking black. Contrasting fabrics and textures, from feathers and ruffles to sequins and pearls were meticulously hand-embroidered onto each breathtaking piece. Saab's signature style of timeless femininity and elegant lines was clearly present as full skirts and cinched in waists prominently featured in his Spring Summer 2015 Collection. The video clip above is of the final run from the show - my most prized Paris Haute Couture Fashion Week possession (thank goodness for smartphone technology!). I captured it on my iPhone before I had to dash off to work and apologise for my unsteady Blair Witch Project style videography! On the right were people from the fashion industry. Just in a day's work for them..! 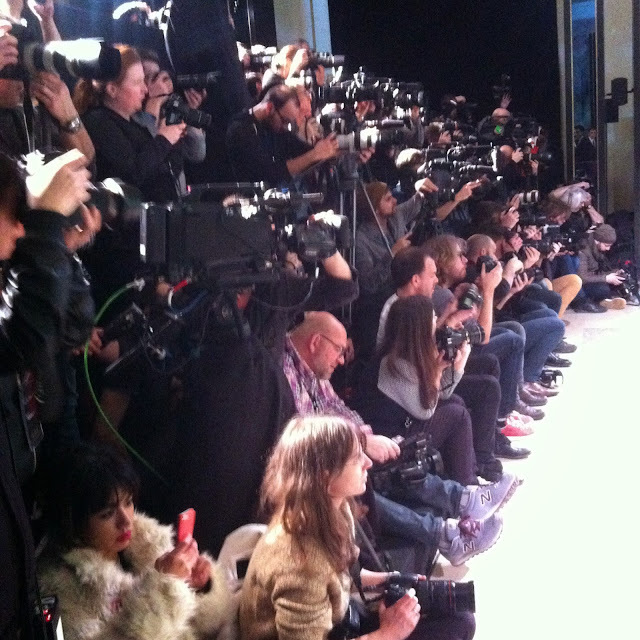 PS As you can see, there was a LOT of flash going on from the photographers next to me! 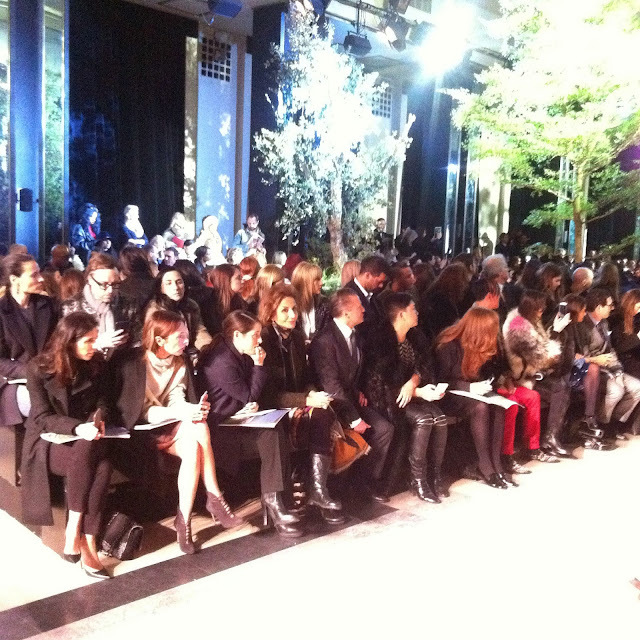 You can barely see the faces of model Nieves Alvarez, Dita Von Teese and French actress Clothilde Courau. About 15 minutes after the scheduled starting time, lights were dimmed and the security guards roped off the area to refuse any latecomers. A little introduction to Elie Saab's inspiration for this collection was heard over the PA system before the music started to welcome us into his magical fairy tale world. This video clip will give you an idea of the mood from the show. I love the music from this clip and how it brings to life the theme of Elie Saab's inspiration - Beirut, the Paris of the Middle East. I love a dress with pockets. 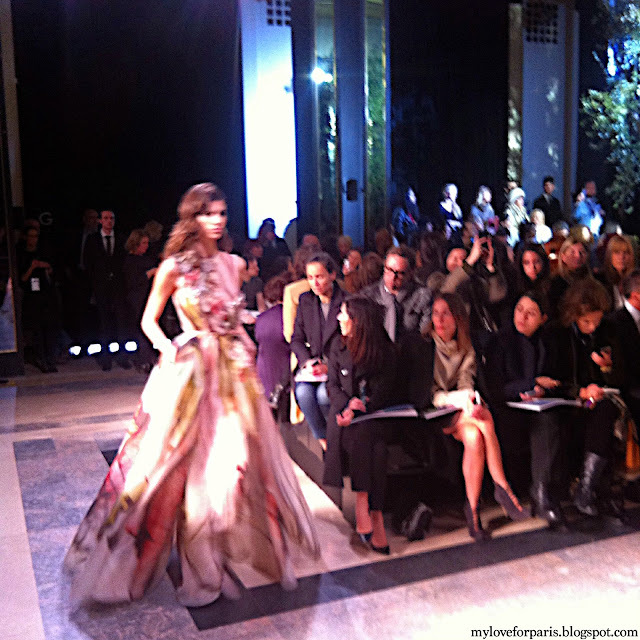 An Elie Saab dress with pockets? Even better..! What a week it has been! Being able to briefly enter Elie Saab's fairy tale world was such a surreal experience. I kid you not, I am still pinching myself today..!